BAGUIO CITY, April 27, 2018, Project i-Pantawid partners and stakeholders shared and discussed case stories of how citizens and government engaged each other that resulted in improved health and education service delivery, reduced benefit gaps, empowered Parent Leaders, and more responsive government. 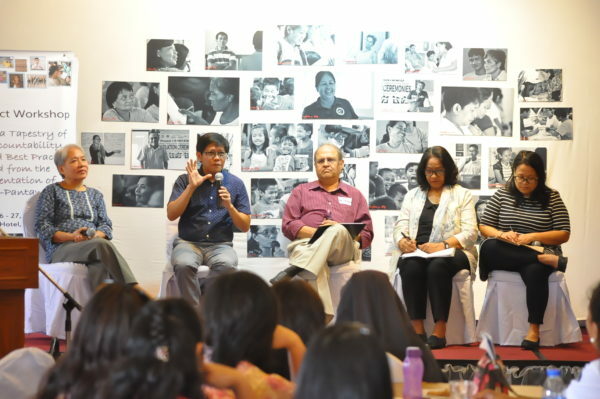 The project final workshop highlighted the importance and urgency of Social Accountability in implementing social protection programs such as the Pantawid Pamilyang Pilipino Program. The project, Guarding the Integrity of the Conditional Cash Transfer Program in the Philippines (Project i-Pantawid), held the final workshop at Golden Pine Hotel in Baguio City on April 26-27, 2018. An exposition of Social Accountability case stories illustrated how the practise of Social Accountability has prompted change in the lives of 4Ps beneficiaries, and ultimately, the larger community. The main platform for introducing and practicing Social Accountability was the Enhanced Family Development Sessions (eFDS). Parent Leaders (PLs) are 4Ps beneficiaries as well, chosen to assist in implementing the program. Under Project i-Pantawid, PLs were trained to cascade lessons – mostly active citizenship lessons – to their respective groups; and to lead their groups in engaging with government, to claim their rights, and to actively participate in community affairs. Stories were told of PLs overcoming their confidence gaps – from being timid and uninvolved due to their low socio-economic status – to empowered community leaders. Accounts of PLs’ leadership were shown in their implementing and monitoring group projects such as communal vegetable gardens, barangay budget monitoring, feeding programs for malnourished children, and concluding social contracts with their municipal governments. At the close of the 2-day workshop, exemplary PLs were given a Certificate of Award, recognizing their performances as facilitators of eFDS modules and initiating changes in their communities. The Global Partnership for Social Accountability-World Bank (GPSA-WB) provided resources for the Project i-Pantawid that was implemented by local CSO partners and the consortium of Project i-Pantawid partners comprising ed of the Concerned Citizens of Abra for Good Government (CCAGG), Partnership for Transparency Fund (PTF), RECITE, and Affiliated Network for Social Accountability in East Asia and the Pacific (ANSA-EAP). CCAGG is the lead NGO and hosts the project management office at 2ND Floor, DZPA Building, Rizal cor. Zamora Streets, Bangued, Abra.